Chef Sigisbert “Bear” Valets has just opened his own restaurant, La Fontaine, in Aix-en-Provence. It’s an immediate success—glowing reviews and a loyal clientele, including our favorite investigative duo, Verlaque and Bonnet. But when he decides to extend his restaurant’s seating into a historic courtyard, some very powerful neighbors are against him. The local historical society wants the courtyard, which witnessed a seventeenth-century hanging and two World War II-era murders, to remain untouched. Valets charges on, even after a skeleton is found buried next to the courtyard’s ancient fountain. But when Valets begins receiving threatening letters, he becomes convinced that his life is in danger. And then the fountain inexplicably stops running. By disturbing the garden, has Bear triggered an age-old curse? And can newlyweds Verlaque and Bonnet solve the mystery before someone else ends up dead? 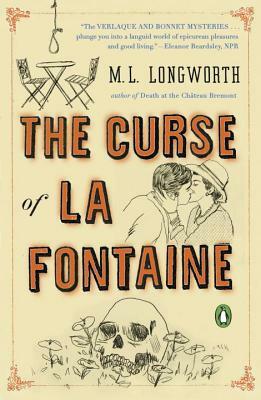 Set against the blossoming backdrop of the south of France, M. L. Longworth’s latest is sure to thrill fans of Donna Leon and Andrea Camilleri.